Greece intends to keep repaying its debt, a government spokesman said, days after Interior Minister Nikos Voutsis warned it had run out of funds. Greece and its creditors must reach a deal within weeks to unlock bailout funds needed to honour debt repayments. 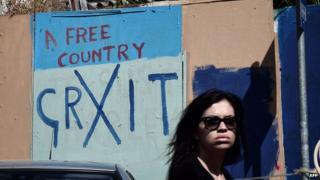 The government, led by the radical-left Syriza party, was elected in January on a pledge to end austerity measures imposed as a condition of its €240bn (£170bn; $263bn) bailout. It has spent the past four months trying to reach a deal with creditors in the IMF, the European Union and the European Central Bank to release the final bailout tranche, worth €7.2bn. In a Greek TV interview over the weekend, Mr Voutsis said the repayment money owed in June "will not be given and is not there to be given". On Monday, however, Mr Sakellaridis said the government wanted to meet its obligations. He also said a deal would soon be reached in talks with creditors. He also dismissed the possibility of imposing capital controls if repayments were not met, as has recently been suggested by some experts and an opposition MP. Earlier, Greek Finance Minister Yanis Varoufakis also told the BBC that progress was being made towards resolving the deadlock. European stocks fell on Monday after Mr Voutsis's remarks that Athens would struggle to meet its upcoming debt payments. Stocks on Greece's ATG index are trading 2.13% lower on the day at 822.34. Greece's last cash injection from its international creditors was in August and the final instalment of its bailout is now seen as vital.